When things are going well for the Yankees, I tend to look at the standings a lot. From when I was eight years old during the 1995 season through when I was 25 years old during the 2012 season, I looked at the standings A LOT (with the exception of 2008). During 2013 and 2014, I tried my best to avoid the standings each day, especially in August and September after each season-crushing loss. A 6 1/2-game lead in the division with the Orioles being the closest in the loss column at seven back has the Yankees sitting incredibly well for the final 67 of the season. Let’s say the Yankees went 34-33 in the final 67 games, playing .507 baseball for the rest of the season. They would finish 89-73. Here is what the rest of the AL East would have to do just to tie them. But the Yankees aren’t going to play just .507 baseball the rest of the way and those four teams, none of which are above .500, aren’t going to play as well as those numbers say they need to, which would have only tied them with the Yankees choking away the season. The Yankees are on their way to where they haven’t been in three years and it’s all because everything that went wrong in 2013 and 2014 is going right in 2015. After two years of everything and I mean everything going wrong for the Yankees, everything is going right for them in 2015. Well, maybe not everything since Stephen Drew is still playing second base and Brendan Ryan is still on the team, but even those two examples prove how fortunate the Yankees have been this season. If it were 2013 or 2014, not only would Drew be starting, but so would Ryan, in the same infield every day and likely hitting in the middle of the order the way that Ichiro, Lyle Overbay and Vernon Wells were asked to nearly every day in 2013. Instead, the Yankees have managed to have the second-best record in the AL as of today with their everyday second baseman hitting .188. The team was able to overcome an embarrassing 3-6 start to the season and a frustrating 1-10 stretch in May, which is when the 2013 and 2014 Yankees fell apart and never recovered. They have won games started by Jacob deGrom, David Price, Max Scherzer, Chris Archer, Scott Kazmir and two games started by Felix Hernandez. 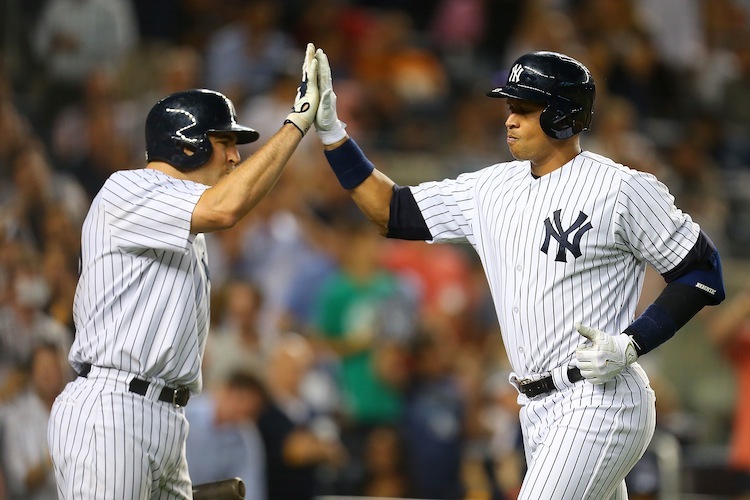 They have kept on winning even with Joe Girardi constantly giving unnecessary days off to his best players like how he sat Brett Gardner against a lefty on Saturday or how he sat A-Rod on Sunday after he hit three home runs on Saturday (fortunately the Yankees won both games). And they have overcome having two reliable starting pitchers (both of which are frequently given extra rest between starts), having two starters (CC Sabathia and Nathan Eovaldi) who are coin flips every five days and having their most consistent first-half starter put in the bullpen because of money (Sabathia) and “stuff” (Eovaldi) instead of results. The Yankees have overcome injuries, underachieving, questionable signings and irresponsible roster and lineup decisions to get to where they are. To think that the Yankees could be where they are right now with arguably their best three players in the rotation, field and bullpen in Masahiro Tanaka, Jacoby Ellsbury and Andrew Miller not having all been healthy at the same time from April 24 to July 7 isn’t remarkable or impressive, it’s flat-out ridiculous. And they are where they are even with those three extended absences because Alex Rodriguez and Mark Teixeira have turned back the clock to 2009-2011 when it was Teixeira who would hit third and A-Rod who would hit fourth as the most feared 3-4 combination in the majors; and because Brett Gardner went on the hottest of his patented hot streaks imaginable; and because Dellin Betances, Chasen Shreve and Justin Wilson got everyone out. The performances of A-Rod and Teixeira and Gardner and the bullpen overshadowed Chase Headley’s abyssmal first full season with the Yankees, Didi Gregorius’ New York growing pains, Carlos Beltran’s inability to produce and stay healthy and the constant struggle for Sabathia and Eovaldi to pitch six innings. Now there are 10 weeks left in the season and the Yankees are as healthy as they can be without any regular position player, starter or reliever on the DL (knock on all of the wood around you) and they are another stretch like they have had the last two weeks from running away and hiding with the AL East. Some Yankees fans just wanted a return to the postseason in any form in 2015 and that meant accepting a spot in the wild-card game. Me? I wanted the Yankees to win the AL East when the season began the same way I do every season. I wanted to know that the Yankees would be playing past Game 162 and Opening Day wouldn’t be the only day with bunting draped over the second and upper decks at the Stadium. I wanted everything to be the way it used to be and now it looks like it will be. It feels good to have the Yankees back where they’re supposed to be. It feels good to have the baseball world right again.